I've been teaching private piano lessons in Rogers for over 20 years. 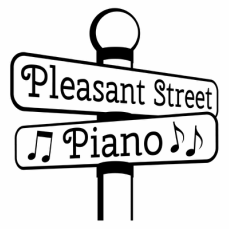 Pleasant Street Piano was branded a few years ago, named after the newly installed street sign in our yard! My home studio consists of a small grand piano, a digital keyboard, computer, a parent's chair, and LOTS of resources including an iPad, the ever popular Piano Maestro app, Rhythm Menagerie by Compose Create, Games from Teach Piano Today, and both digital and printed music. We have a treetop view to the south, and the moon rise through the trees to the east during the darker winter months. Our two yearly recitals take place the last weekend before Halloween and late March. We typically entertain an audience of around 40 family and friends in the great room using my Kawai grand piano.